Your experience with the most modern technology begins before you encounter any lasers! 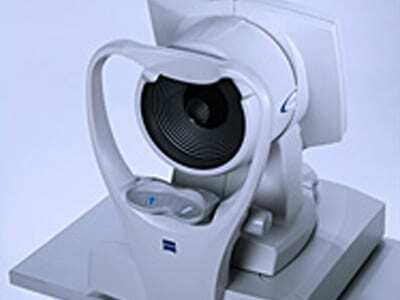 The Advanced SoCal Eye Evaluation is a cutting-edge consultation exam designed by our doctors. Whether or not you go on to have surgery, this evaluation provides valuable information that you should know about your eye health. We perform an in depth analysis of the health of your eyes using state of the art equipment and expertise listed below. Everyone’s eyes are different, and so our goal is to determine the best option for you, not only for today, but also to keep you seeing well for a lifetime. ATLAS CORNEAL TOPOGRAPHY – the cornea, like the surface of the earth, is generally sphere shaped, however there can be local differences in elevation, like mountains and basins. Topography provides a map of the surface of your cornea similar to a topographical map of the earth, measuring the relative amount of curvature at thousands of points on the corneal surface. Understanding the corneal surface curvature is necessary to determine the optical power of the cornea, one important factor for planning treatment. In order to perform all-laser LASIK and get the very best results, using the most modern technology is essential. Our surgeons have experience with a number of different modern lasers, and after carefully researching and testing various lasers, they have chosen the lasers they feel are the best and will provide you with the best possible visual outcomes. The Femto LDV Z is a femtosecond laser used for making a precise LASIK flap. This portion of the surgery used to be done with a very precise blade known as a microkeratome. Even though the idea of a blade near your eye is scary, these advanced instruments were able to provide safe and reliable results when used by a skilled surgeon. Nonetheless, the femtosecond laser provides even greater precision and ability to customize the shape of the flap. This not only enhances safety, but also helps provide a smoother flap interface, the likely reason for the rapid visual recovery. In a recent study using the Ziemer femstosecond laser and the Allegretto laser (the same technology we use), it was found that 100% of select patients achieved binocular vision of 20/20 or better within 24 hours of surgery. * The study also demonstrated that contrast sensitivity had returned to baseline within 24 hours of surgery, and actually improved from before surgery over the next month. Keep in mind you’re your eyes may differ from those in the study, so 100% 20/20 vision day one cannot be guaranteed, though this study gives us an idea of the remarkable results with these lasers. The Femto LDV Z uses a unique technology that distinguishes it from other femtosecond lasers. Using very low pulse energy and very short pulse width with greater frequency, the LDV achieves the same smooth cut as previous generation lasers but with less energy. Lowering energy minimizes side effects and tissue stress, thereby providing increased likelihood of rapid visual recovery. This strategy is coupled with wavefront optimized optics that provide extremely precise treatment. More tissue is preserved and there is almost negligible production of gas bubble byproducts. All this is achieved in under 20 seconds per eye! The Allegretto uses the innovative “wavefront-optimized” treatment plan in combination with numerous safety technologies. You can think of “wavefront-optimized” treatment as the next generation therapy. The first generation lasers used a “conventional” treatment pattern, reshaping the cornea to change the power in a way that matched a glasses prescription. The next generation of lasers included the “wavefront-customized” platforms that customized the treatment to the optics of the patients eye to provide even better vision while minimizing visual side effects. The Allegretto “wavefront optimized treatment” is the next generation technology: it takes into account everything we learned from the previous generations of lasers while additionally preserving qualities of the natural corneal shape, a value known as asphericity. In this way, the Allegretto uses measurements of your natural corneal curvature and then designs an individualized treatment that preserves the most normal curvature characteristics while reducing the total amount of treatment that must be given. The Allegretto is also unique in compensating for the treatment phenomenon known as the cosine effect. In earlier laser systems the treatment was designed for a theoretical flat circular surface. However the cornea is not flat, and therefore laser spots treating peripheral corneal zones will encounter the cornea at an angle. This leads to some loss of power and the spots having less effect than desired in the peripheral cornea, the phenomenon known as the cosine offset correction problem (because the amount of power loss is proportional to the cosine of the tangent at the point of laser contact). To compensate for this problem, the Allegretto applies additional laser spots to the peripheral cornea. In addition to all of these advantages, the Allegretto is one of the fastest lasers available. Quicker treatment is important for patient comfort and safety. While the treatment is ongoing, the laser is tracking your eye position hundreds of times a second, ensuring that the treatment is accurate. If the laser cannot apply the treatment to the precise spot indicated, perfectly centered, then the safety mechanisms will halt treatment until realignment is achieved. This gives you the security that even if you were to accidentally look away or at the wrong spot, the laser will measure this change much faster than you can move your eye and stop treatment before any laser power is applied to an incorrect spot. The Allegretto additionally uses an advanced air evacuation system that keeps the air between the eye and the laser free of particles, thereby ensuring greater accuracy and efficiency. The Allegretto provides high-quality vision by incorporating the lessons we have learned in the past 20 years of LASIK into a cutting edge treatment plan. Thanks to the correction for cosine-offset, the aspheric treatment design with wavefront optimized optics, and the top of the line safety systems, patients are benefiting from easier, faster, safer, and better treatments than before.